Etymology: the name "Forsythia" was created in 1804 by Martin Vahl, botany Professor in Copenhagen, Denmark, in honor of William Forsyth, responsible for the Royal Garden of Kensington in Great Britain. Origin: hybrid got by crossing between Forsythia suspensa Forsythia and viridissima (1885). Habitat: shrub preferring soils rich in humus and moisture, and a sunny position. Deciduous foliage. Light green leaves, from 8 to 10 cm, opposite, lanceolate, roughly toothed on the final part of the leaf. Abundant flowers, appearing before leaves, in February-March, of yellow gold colour due to carotenoids presence. Flowers are grouped by 2 or 3 along stems. The prebloom is twisted (petals become covered mutually in the bud). Fruits: loculicidal capsules, seeds, equipped with a short wing are albuminous. - Forsythia suspensa : wChinese origin, trifoliolate leaves, more hardy (zone 4). 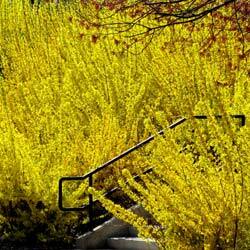 - Forsythia x intermedium ' Spectabilis ' with big yellow flowers. Use: very decorative shrub because of its nice blossoming which announces the spring. The Forsythia is one of the first shrubs (with the magnolia) to be decorated with flowers at the end of the winter. It is planted in hedge or insulated. The Forsythia fruits are part of the Chinese pharmacopeia. after blossoming, prune severely the branches which develop haphazardly and intertwine.